Style Me Pretty has done it again…this time, “glossy-style!” Their team continues to inspire millions in an oh-so fashionable way, and we are just tickled pink to be part of this wonderful piece of work. AND be ready to revisit an absolutely delicious wedding that we had the pleasure of photographing last year – The Edge’s! Today is a very big day for them. 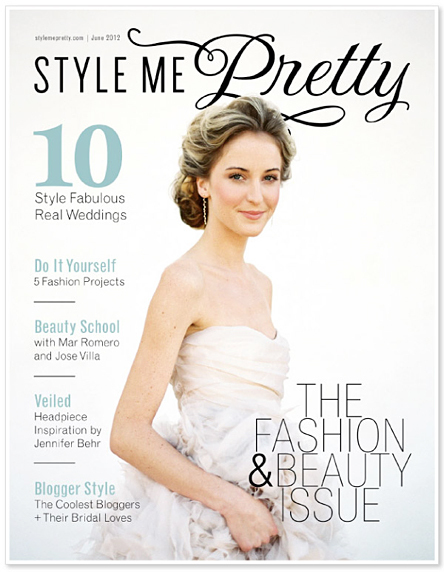 A feature in the e-Magazine AND a feature front and center on Style Me Pretty’s main page. WOW! Now that is what I call, “MONDAY!” Thank you once again, Style Me Pretty!!! Drew - So incredibly exciting KV!! Seriously makes me tear up thinking about what an incredible and inspiring photographer I work for!